There are several different types of verses in the Bible – commands, prophecies, genealogies (amongst others). I’ve been itching to study a genealogical verse for some time. The nature of this entire blog, this re-Ver(sing) Verses project, is based on the notion that every single verse in the Bible can be studied. That includes genealogy, which often seem nothing more than a chunk of names of nobodies. Granted, I’m no Hebrew scholar, and I’m very lacking in the history of Israel – hence I’m beginning with one of the meatiest genealogical verses in the Bible (at least it is to me) – Matthew 1:5, of the genealogy of Jesus from David. This should be fun. There are only 4 women named in the genealogy from David to Jesus listed in Matthew 1: Rahab, Ruth, Tamar, Mary. Mary is of course the mother of Jesus, undoubtedly the most well-known female individual in the entire Bible. Though there were many other outstanding women in the Bible, few had their names recorded, and even fewer can possibly be as well-known as Mary. Yet as outstanding as Mary was, there were 3 other women who (arguably) had the same privilege as she had – of being recorded in the lineage of Jesus. Rahab and Ruth are both listed in Matthew 1:5. Tamar is another interesting case, but I’m not studying her story today. We will be looking into both Rahab and Ruth, although not in great details (especially for Ruth, that woman has an entire book to herself!) – along with the men in their lives as listed in the verse. The ancestors of Jesus as listed in Matthew 1:5 are, Salmon, Rahab, Boaz, Ruth, Obed and Jesse. I was actually rather surprised that Rahab was Boaz‘s mother, because nowhere in the book of Ruth was Rahab mentioned. In fact, in the genealogy of David from Ruth 4:18-22, the women were not recorded. While Ruth had an entire book to detail her story, Rahab did not. Her story can be found in Joshua 2 and Joshua 6:17-25, where she welcomed, hid and protected the spies in Jericho, in turn exchanging pardon for her and her family when the Israelites conquered Jericho, even living amongst the Israelites. Rahab was mentioned in the ‘Hall of Faith’ – Hebrews 11 – outstanding, because her act of faith was also recorded, where the likes of Gideon, David and Samuel were lumped together [Hebrews 11:31]. Also, James extols her good actions, which justified her on top of her faith [James 2:25]. The most notable thing about Rahab was probably her status as a prostitute. Most English versions translated the term as harlot or prostitute, and while some have argued that the Hebrew word used could mean an innkeeper as well, it has generally been accepted that the original word used for it is most commonly used to mean prostitutes. While prostitutes generally have a low status in society, Rahab had traditionally been used as an example that God‘s grace transcends status or occupation. She married Salmon. Now, who is Salmon? In 1 Chronicles 2:10-12, we see another list of genealogy, this time an expanded one from Jacob to David. It does not shed much light on Salmon, but it does mention that Nahshon, the father of Salmon, was the leader of the people of Judah. Salmon‘s father was the leader of the largest tribe in Israel, and as his son, perhaps Salmon inherited that position as well. Whether he did or he didn’t, he was certainly an influential and powerful figure – Boaz, his son, was noted to be wealthy and influential in the Book of Ruth – Rahab ended up marrying well, and had a good son in Boaz, who was righteous. Boaz married Ruth, an amazing woman whose character can really be summed up from her words to Naomi, her mother-in-law (another outstanding woman) – Don’t urge me to leave you or to turn back from you. Where you go I will go, and where you stay I will stay. Your people will be my people and your God my God. Where you die I will die, and there I will be buried. May the Lord deal with me, be it ever so severely, if anything but death separates you and me [Ruth 1:16-17]. Such fierce loyalty and love she has to her mother-in-law! Naomi had two good daughter-in-laws, Orpah wanted to stay with her as well, but practicality took over, and she left [Ruth 1:14]. Orphah was oustanding – her name was left behind in the Bible (not many women got to be named!) but Ruth‘s name was not only recorded in the Bible, it can also be found in the genealogy of Jesus, it can also be found as the title of one another book in the Bible. I’m not going to go too far in my study of Ruth – there’s always the entire book of Ruth to come back to study again. But there’s one more thing about Ruth that’s amazing. Remember the list of ancestors of Jesus that are named in this verse? 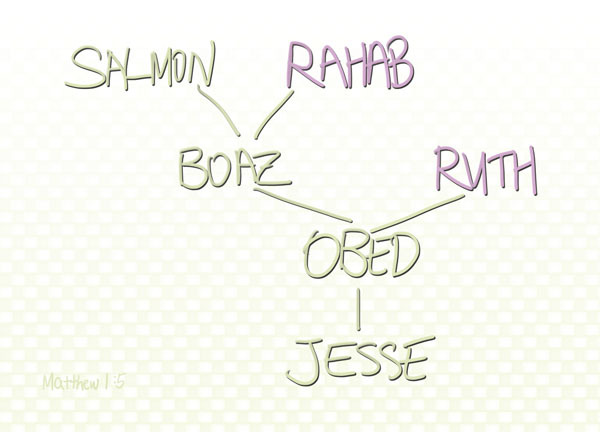 Salmon, Rahab, Boaz, Ruth, Obed and Jesse. Jesse. Does that ring a bell? Jesse, father of David, King of Israel. Ruth‘s son Obed was the grandfather of King David. Wow. We don’t know who David‘s mum was. We don’t know who Jesse’s mum was. But we know who Obed‘s mum was. And we know who Boaz‘s mother was. Ruth and Rahab. Two amazing women who were rewarded after their deaths in the form of their descendants. Imagine if Naomi never went to Moab? Or if Ruth never clung to Naomi? While Naomi is not technically found anywhere in the genealogy of David or Jesus, she is remembered on account of Ruth. How can you not think of Naomi when you think of Ruth? After all, in Ruth‘s own words, where you go I will go, where you stay I will stay, where you die I will die, and there I will be buried. Wherever you see Naomi, you will find Ruth. Likewise, wherever you see Ruth, you will think of Naomi. In Ruth 1:20-21 Naomi expressed her bitterness against the plight that God has handed out to her – yet through all that she had suffered, we see God‘s amazing purpose shining through – all of the events that led up to her return to Bethlehem were merely a prelude for God to induct Naomi and Ruth into the heritage of Jesus. What a privilege! What an honour! It is with utmost regret that I failed to study more on Obed and Jesse – Jesse in particular, in a few encounters with his youngest son David and the prophet Samuel, could be an interesting study. But in this verse, truly, it is the women who attracts the most attention. So many lessons, so many takeaways. Rahab is a woman whom I have come to admire. Looking at the lineage, God had a plan and she accepted the challenge. What a woman. What a life.